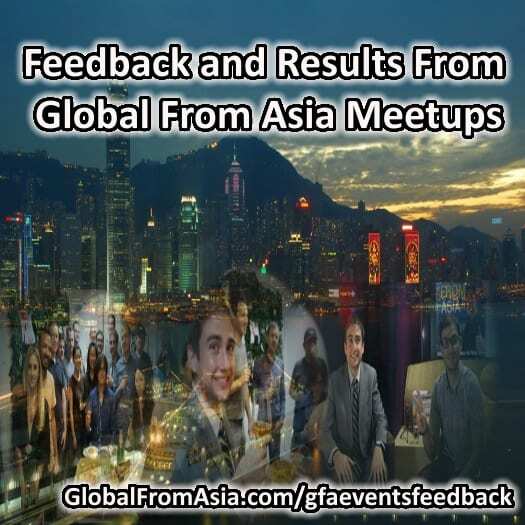 Have you had a chance to make it to our Global From Asia meetups? We started hosting a few on our events page and want to share with you some of our findings today. So our first one, the office opening was a bit more formal. Andre Martin from High Hide helped setup the office perfect for podcast recording. Even video recording! (Video still undergoing editing!) There was an audience of about 20 people and it was a bit cramped in our space! I enjoyed having an audience while doing the show, and even got Jon Buford to come up and share some stories and engage on the show as well. So a lot of fun! Then we had food and drinks after and networking. Felt like that is what people enjoyed. But many didn’t even want to eat, they ate already or would eat later. So the next meetups we kept it more informal, and FREE. I don’t want the money to become a barrier, and more interested now in the learning what people want and getting feedback. So we just finished our third meeting and it was the most informal of all. Bring your own food and drink, and we had some beers in the fridge for those who forgot it. Yet some wanted more formal round table style. That way each person could get to know each other and know who to talk to. As opposed to just networking and talking 1 on 1 to every person to figure out who did what. Round Table, each person introduces themselves, shares what they are working on. We try to see if there is a theme we can all discuss and solve, in an informal way. Networking, talk to people who seemed interesting at the round table based on what you’re doing in your business. Sounds cool? Let’s keep them free for now. Though Andre and the others at the space may get upset at me as the beers disappear and the place is a bit of a mess to clean up after. But let’s find a format people like, and then add value. Also, Don’t Forget Our Big Summit in April! And yes, been working hard at getting the first annual summit. It’s called Cross Border Summit and happening on Saturday April 16, 2016! These smaller meetups have helped me get a better understanding of what people are looking for and what the needs and desires are. Also, I plan to do more podcasts based on the topics I hear about. What Do You Think – A Podcast Adding Monthly Events? As I keep saying, I rely on your feedback. What do you think? Like a monthly free meetup or a low fee one, and then an annual big and formal paid summit? Will always work to the best of our abilities to make a huge ROI on your investment of time and the fees. Many podcasts have evolved this way, and we think it is a great way to go. Get the podcasts, learn and meet people online. A lot of our guests have gotten people asking them for Linkedin requests and more. Then we can have physical (in-person) meetups to further strengthen the connection. I’d love to hear if you agree or think this is crazy! Please leave a comment below, and have a great day!